Turning your passion into a business is the ultimate dream. But that dream doesn’t come so easily. It requires work, focus, and consistency. There are challenges around every corner. Fortunately, volunteers (entrepreneurs) don’t have to go it alone. Their chance of success increases dramatically with access to Social Media, knowledge and a step by step guidance of experienced Volunteers. Sharing everyday Posts with Friends and Fans. Invite High Powered Individuals and Organizations to become Volunteers. 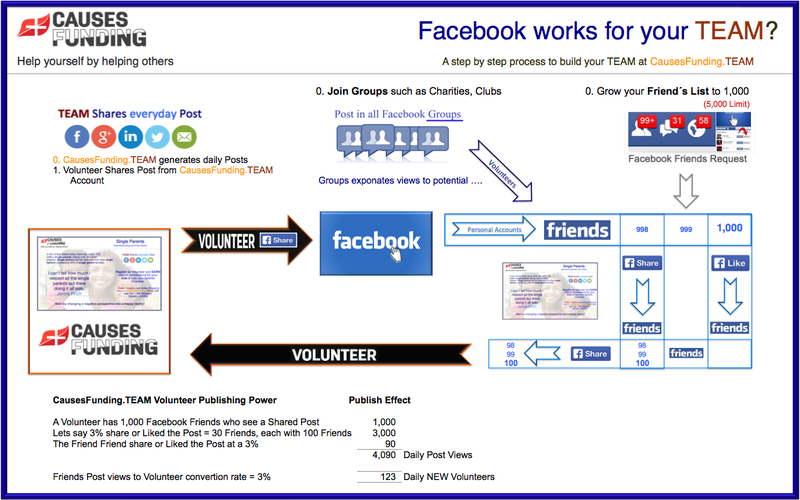 Every time a Volunteer share Post thru CausesFunding.TEAM platform, all friends will see it, If they like it, all friends will see it too (exponential effect). There is a good chance for them to become Volunteers and be part of your TEAM. The largest Social Network by far with over one billion users with 72.4% of internet users being active. Average = 350 – Compare to your actual numbers! Look for friends and peers from the past, school, college, jobs, clubs. Reviewing friends from your friends will expand your TEAM. Twitter - a great tool for instant messaging! How many users are on Twitter? As of the second quarter of 2017, the microblogging service averaged at 328 million monthly active users. How many tweets are sent per day? Every second, on average, around 6,000 tweets are tweeted, which corresponds to over 350,000 tweets sent per minute, 500 million tweets per day and around 200 billion tweets per year. CausesFunding.TEAM Tweets include images that receive 18% more click-throughs, 89% more likes, and 150% more retweets. How many direct messages can you send on Twitter? Direct messages are limited to 140 characters, the same as tweets. Users can send multiple direct messages in succession as there is not a limit on messages per hour. Twitter will only display the 100 most recent messages to a user, including messages sent and received. What is an impression on twitter? Are twitter impressions described as the delivery of a post or tweet to an account? Twitter stream. The stream is composed of several tweets from various sources. LinkedIn, is a social networking service for businesses and professionals, as of 2016 reveals that the majority of members are based in the United States with 128 million Americans registered on the site. 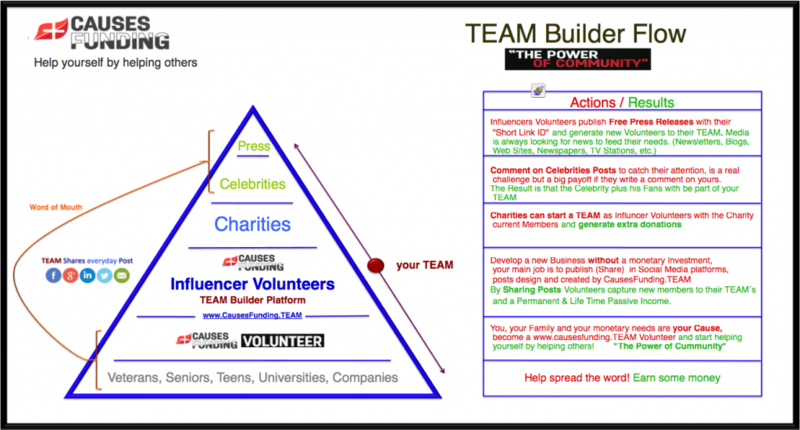 The site allows Volunteers to create profiles (Influencer Volunteer and/or Professional Fundraiser and make connections with others Fundraisers or Charities to be part of your TEAM or as a way of establishing professional relationships. Apply to join the Groups in LinkedIn of organizations where you are a member such as Alumni Associations, Clubs, Labor Unions, Charities, Companies, etc. 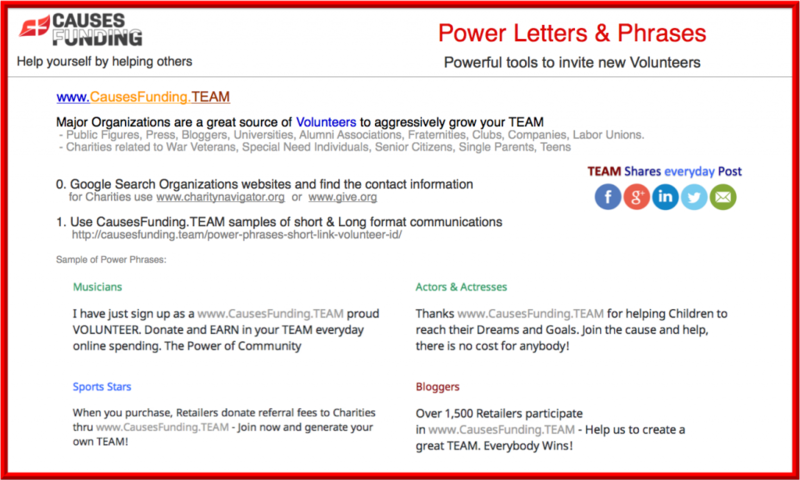 Send an “email” to the group administrator to introduce CausesFunding.TEAM as a donations source to the organization. Use the sample letter/email. You can reach Charities CEOs´ and Presidents and include them in your network, they will receive your daily posts and can promote CausesFunding.TEAM (with your Short Link ID) with their Volunteers. Everyday CausesFunding.TEAM generates Posts for Volunteers to share them on their social media platforms (Facebook, Twitter, Google + & LinkedIn). 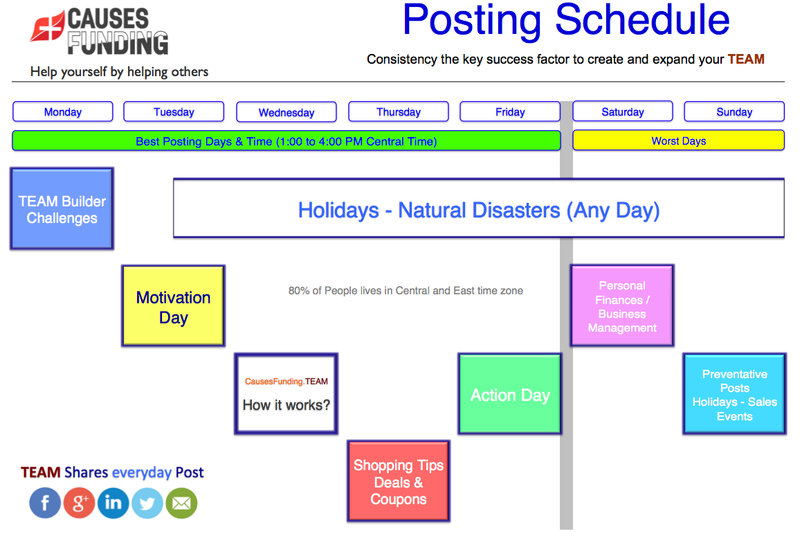 To Share Posts follow this process while logging in CausesFunding.TEAM goes to Volunteers = EARN + Donate and select TEAM Builder menu option. D.- Natural Disasters Alert – Reminders for Volunteers due to emergencies is time to Donate in their everyday spending. What are Power Letters & Phrases? Is an effective way to inspire, motivate and persuade to join CausesFunding.TEAM as a Volunteer and help built your TEAM among massive sources of Volunteers such as Press Reports, Public Figures, Charity Directors, Alumni Associations, Labor Unions, Companies HR, etc. If you have access to any person with the power to massively expand your TEAM. A positive collaborative mindset mean the difference between success and failure. Don´t be shy ask for help!